This is a work in progress - I post it in the hopes of learning more. 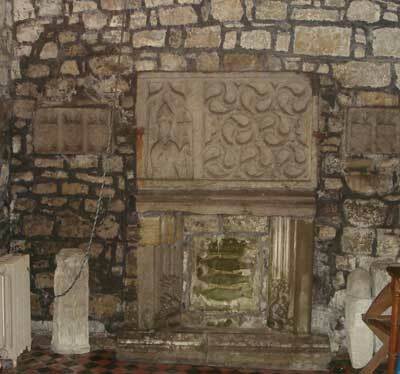 The search for the family crest of the OLIVERs of Ulster is still proving elusive, though thanks to some recent photos from the cathedral at Trim, we may be getting closer. First, let me review what started me looking for this crest. According to Amy Oliver JACKSON (1874-1962), the OLIVERs were of French Protestant origin, who took refuge in the Netherlands and came to Ireland with William of Orange's Army. 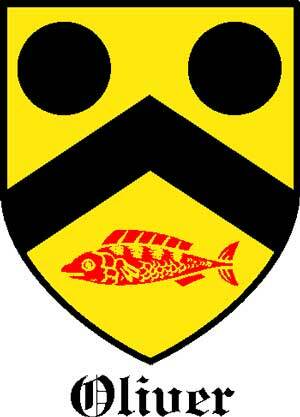 And they had a crest which included three fish. That is still about as much as we definitively know. This means that we still need to keep a sharp eye out for OLIVER Huguenots and fish. Prefereably together. The possible OLIVER-Ireland-Huguenot connection gains some credence thanks to an article on Benjamin PEMBERTON whose 2nd wife was a Rachel OLIVER of St. Michan’s Parish, Dublin. According to tradition among her descendants in the 19th century she was of Huguenot extraction and owned a French Bible: her parentage has not been discovered although the will of her eldest son Benjaminin 1795 refers to his "grandfather Oliver." A Francois Olivier, cabinet-maker, and his wife Marie had children bapt. at the French Church, Peter St. and Lucy Lane, Dublin 1719-22; a Jean Olivier, stocking-maker, m. Madeleine Bani in the French Church of St Patrick, Dublin, 1699; the will of a John Oliver of Dublin, wigmaker, was proved 1732 (Prerog. ), and the will of a Susanna Oliver of Dublin, widow, was proved 17S8 (Prerog.). I would assume that Amy’s reference is to the Limerick OLIVERs. 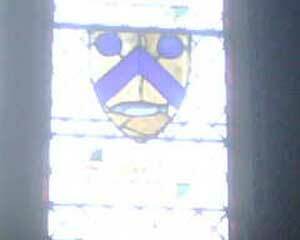 There is an OLIVER family crest in the Armagh Cathedral but it only has one fish and the crest is that of the family of Canon Silver OLIVER (1788-1844), the rector of Loughgall. He was descended from the OLIVERs of Limerick (if it warrants, I will assemble and post a tree on that line later). I am including pictures of this crest as part of perhaps closing in on any links between the Ulster OLIVERs and the Limerick OLIVERS (doubtful – but since there was a long association with Armagh, I want to keep an open mind). 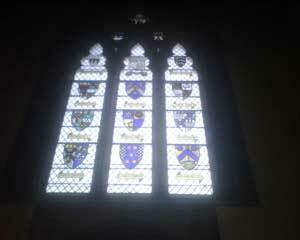 All these crests represented people who had donated money for the 1834 restoration of the Cathedral: Archbishop Lord John G. BERESFORD; The Very Rev. J.E. JACKSON; The Ven. E. STOPFORD; Johannes YOUNG; Precentor Richard ALLOT; William MAULEVERER; Edmund BACON; Francis GERVAIS; Francis JOHNSTON; Leonard DOBBIN; Canon Silverus OLIVER; James CAMPBELL; Edward CHICHESTER; Richard OLPHERTS and Isabella RICHARDSON. A close-up of the OLIVER crest. 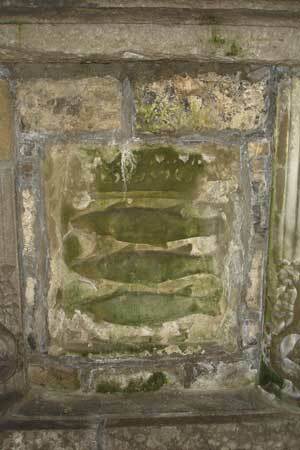 Interestingly, there are three fish as described by family elders in old documents which appear in a KANE family crest. There are also some mid-1700 deeds that connect the KANE and OLIVER families. I suspect that these two families may have intermarried and that the OLIVERs may have then simply appropriated the crest (it seems to happen from time to time). 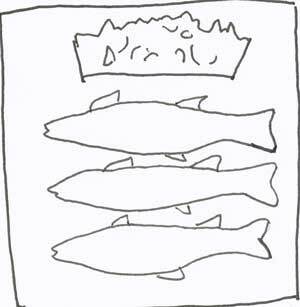 There were no lack of fish in Irish lakes and rivers, so using them in a family crest would not be surprising. 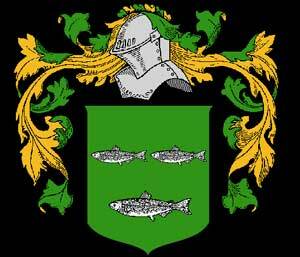 The O’NEIL family crest sports a fish as does the town seal of Coleraine. There are also recollections in early 1900s letters of a more “well heeled branch of the family” who resided in Dublin and whose OLIVER crest included a symbol of a Cathedral. Again, more mysteries. A final note. 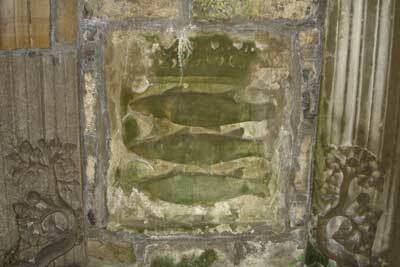 Although I have read Heraldry of Fish: Notices of the Principal Families Bearing Fish in Their Arms by Thomas Moule, I am none the wiser. NOTE: “Benjamin” is a name that popes up with some frequency in our family tree. Irish Ancestor: 1979, Vol 1, p 15 : BENJAMIN PEMBERTON, bricklayer and mason, was of St Andrew's parish, Dublin, in 1731 and of Carter's Alley, parish of St Mark's, Dublin, in the 1740s. He m. lastly (Prerog. MLB 16 Aug. 1731, which calls him a "cementer") Deborah, dau. of William Turner of Dublin, mason (Inventory Dublin Diocese 1741) by his wife Deborah (will proved Dublin 1742). On 27 Sept. 1731, apparently as a post-nuptial settlement, William Turner assigned a house in Carter's Alley, near Lazyhill, to his "son" Benjamin Pemberton. Deborah Pemberton was bur. at St Mark's 25 Feb. 1738, and Benjamin m. 2ndly (Prerog. MLB 31 Jan. 1740-1).